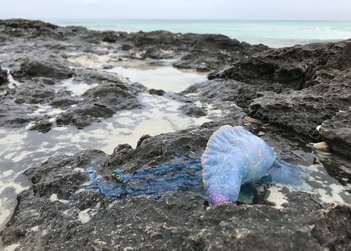 Formentera's Office of Environment reports that in recent days roughly one hundred jellyfish-like organisms, dubbed the Portugese man o' war, have turned up at local beaches and swimming spots. Cleaning crews, which picked up 89 of the marine hydrozoans from Migjorn beach, removed another nine from the area of coast between cala Embaster and es Caló de Sant Agustí and several more from Illetes. Beachgoers who come across a man o' war on the beach should telephone 112. The emergency service has been directed to document information on sightings and pass it along to the Council so the organisms can be removed. Under no circumstances should one attempt to touch a man o' war. Likewise, pet owners are advised to keep their animals from sniffing or stepping on any that wash up on the shore. The CiF environment office reminds islanders that surges in cases of Portugese man o' war or other organisms on the local seaboard are linked to marine and wind currents. As with similar species, anyone comes across a Portugese man o' war should remain calm and proceed with caution.